One of the fascinations of Dr Who is that it is not entirely science fiction. 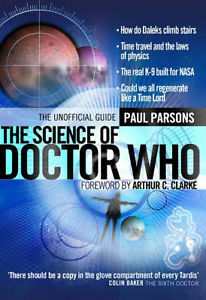 Another Doctor, Paul Parsons, has written this wonderfully entertaining book, The Science of Doctor Who, in an attempt to bridge the gap between the science and the fiction. He wrote the book “to entertain, to boost enjoyment of the show and to answer the questions … of intelligent fans”. He adds: “If I did manage to educate anyone along the way, then I sincerely apologise”. He might well need to do some apologising! Dr Who seems timeless and ubiquitous. I watched the first Dalek story back in 1963 as a 10-year old boy. Forty-five years later the front cover of the Radio Times illustrates the resurgence and ongoing success of the programme by featuring two of the ten Dr Who reincarnations. My young nephew is an avid fan, watching all the latest programmes, writing to the cast and collecting models, and my wife recently enjoyed her birthday outing to the theatre where we watched six Daleks battling on-stage with the Time-lord. Even working at university there is no escape. One building has a full-scale Tardis and another a real Dalek at its entrance. The university home page announces proudly that a current student has been generating gory sounds effects for the programme using melons and other soft fruit. My daughter even tells me that her university once elected a Dalek as president with the single word campaign slogan: “Exterminate!”. At first the concepts in Dr Who seem like total fiction. An early taste of the book comes from the outrageously fun, but theoretically feasible, way in which Dr Parsons attempts to explain “Tardis-space”. How can something be bigger on the inside than the outside? His explanation naturally (!) starts with general relativity and lobes on 2-D rubber sheets, before moving into 3-D space and the bending of space-time. As if all this is too straightforward, he adds some exotic matter generated by the Casimir effect to generate a negative pressure. A quick few paragraphs on quantum physics, wave-particle duality, vacuum fluctuations and negative mass completes the explanation. You’re then hastily off into quantum entanglement and teleportation. After just two chapters you’ve already covered the frontiers of modern physics, not to mention some of the latest research in biology, chemistry and psychology. If you had trouble with relativity first time round, there plenty more to come in convincing you that time travel is possible or whisking you through black holes. Paul Parsons makes liberal use of interviews and quotes from over 100 subject experts to help him explain everything from chameleon circuits to sonic screwdrivers, nanomedicine to genetic engineering, neurobiology to astrobiology, multiverses to mirror matter and quark stars, as well as mathematics from infinity to eternity. As a former cosmologist, and current editor of BBC Focus magazine, Paul Parsons is well placed to give a flavour of the trickier concepts himself. There’s not an equation in sight and just the occasional simple diagram. Suspend your desire for an in-depth understanding and simply enjoy an in-breadth, sideways view of scientific frontiers. Even if, like me, you’ve missed a large proportion of the roughly 200 episodes, you can still follow the plot and be encouraged to watch some of the programmes and monsters that you’ve missed. The Cybermen, Slitheen, Autons, Silurians, Sontarans, Martian Ice Warriors and the Krynoid all receive the Parsons scientific analysis. Astrobiology gets a good look in too, especially when it comes to the monsters. The Drake equation, extremophiles, exoplanets, the origins of life and biochemistry, conditions necessary for life, Mars and ALH84001, Europa and hydrothermal vents, Titan, SETI, SETT and CETI all get a mention. Most topics in a standard astrobiology unit, including my own, are touched along the way. Paul Parsons might have to stretch the imagination to provide scientific explanations of Dr Who paraphernalia, but not all the science is high powered. Simpler ideas, such as the likelihood of taller creatures on lower gravity planets, are provided. It’s not all support for Dr Who either. Paul Parsons is prepared to correct Dr Who when he gets it wrong by suggesting that Ice Warriors on Mars breathe nitrogen, when its thin atmosphere is mostly carbon dioxide. Of course, Mars might have been different in the past. A handful of references are included for further reading, although a few more, especially astrobiology ones, would help, along with an indication of the related chapter or subject area. Just because the book was designed to entertain does not exclude a future in higher education. Parsons does mention the possibility of a sequel to answer further questions provoked by Dr Who. Maybe he’s even considering an extended book series The Science of…. His talent for blending science with fiction should not end here. I’ll certainly be passing on my review copy of The Science of Dr Who to my nephew. He will enjoy its breadth and variety. It may even motivate him to ask deeper questions and follow a scientific career. In the future he could become a cosmologist, geneticist, neuropsychologist, nanochemist, cyberneticist or even an astrobiologist! I got this for Xmas-thanks for the review!